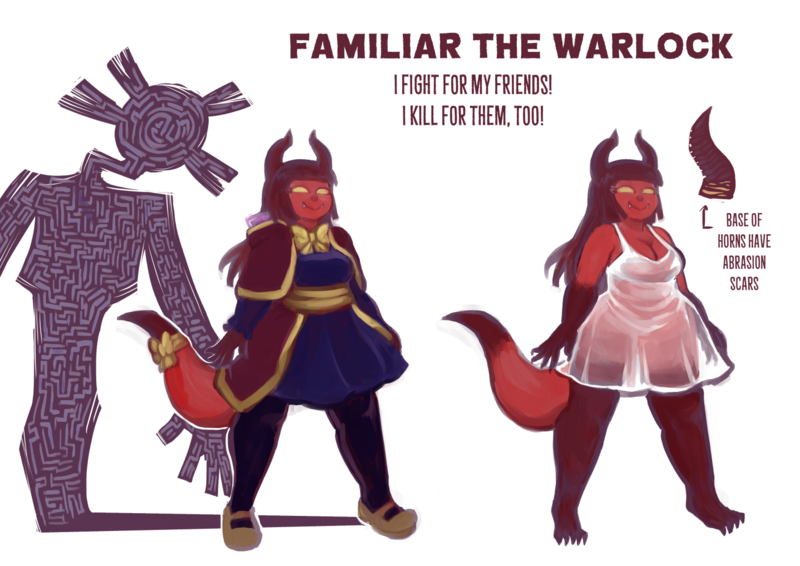 Cute diplomat; ruthless warlock; Lovecraftian magical girl. Behind that adorable face lies a potent magic-user! Though she may not be the strongest, and she uses her spells for weird applications rather than the average warlock, her craftiness can be almost malevolent. Familiar's attitude is that anyone should be able to do whatever they want (and have agency), long as that doesn't enslave, inhibit, or threaten the agency of someone else. While many have been helped by her ideals, the scorched trail of destruction she also leaves would suggest otherwise. Most would call it selfish, but to Familiar and Wallace, they're just doing what they want. So what if she burned down a library-- you're not her friend, why should she care? Originally a servant for the enemy, the eldritch being Wallace was won over by Familiar's pleas to have him join her instead (that and, his then-boss was mistreating him). Now, he lives in Familiar's shadow-- not literally, as he still exists on some 2-dimensional alien plane, and resides with Familiar via a 'connection' (like a hologram, or on a video call). As he is a sentient avatar of knowledge, his strength increases the more knowledge he absorbs-- and the effect increases exponentially, should he become the only source of said knowledge. Thus, original and unique records hold more value to his strength. Familiar's stated goal is for him to protect her, and anyone she deems 'friends'-- and in return, she'll help him gain enough strength to reside in the same plane, and enough volume to embrace her. He does not understand why. -Familiar can speak in eldritch tongues, and thus communicate with Lovecraftian beings (such as, obviously, Wallace). -Familiar's riskier spells (can only do one or two of any, a day): setting a building on fire; upping her speed to escape along a certain route. Her most powerful spell is detecting someone's thoughts, but if used on the wrong person, can severely injure her. 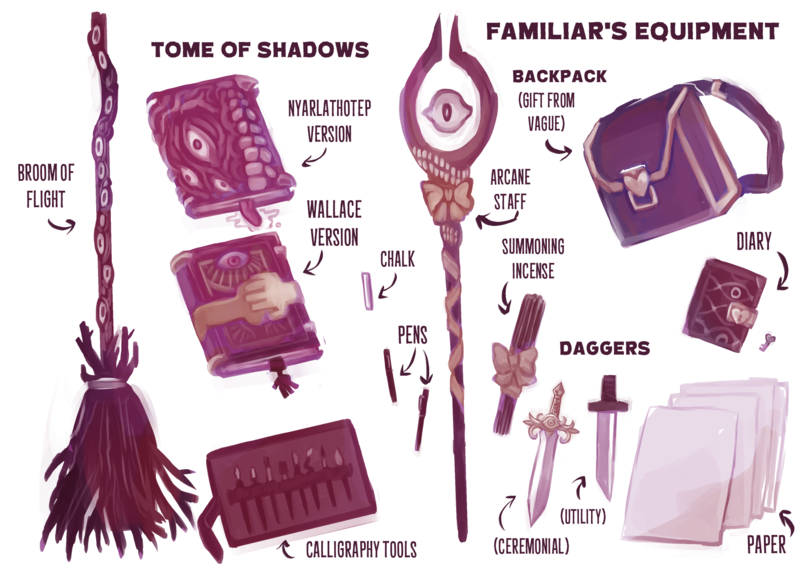 -Wallace can 'scan' and absorb knowledge if he is either summoned in-person and allowed to roam around an area full of knowledge, or if Familiar's shadow passes over it. -Through Wallace as interpreter, Familiar can read all written languages, but it's not certain she'll understand the meaning of said words. -Familiar can call upon Wallace's knowledge by asking him politely, but her questions have to be very specific; he knows quite a bit, after all!